Nowadays employers encourage themselves to promote diversity in organizations. Well, this sounds to be a good idea but diversity in the organization also shares some cons as well. In a culturally diverse organization, there are common issues like Harassment and Discrimination. As an HR leader, you don't want your employees dissatisfied with the organization culture and have lodged complaints regarding harassment or discrimination. Employees will be reporting this issue with the HRs and this is how you should deal with same. 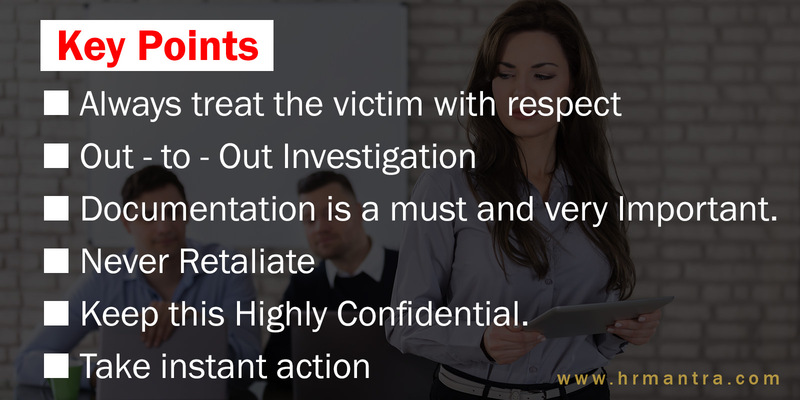 First thing first, after receiving harassment or discrimination complaint management should take firm and immediate action to address the accusations right away. Such accusations not only affect that particular individual but also the whole team. The required steps and decision should be taken ASAP. If this issue remains unresolved for a longer period of time then tension within the organization will arise obviously affecting the productivity. If in case employers fail to take the appropriate investigation into such issues then they are further escalated to a costly battle: possibly a lawsuit. It takes courage to file a complaint regarding sexual harassment issues in the organization. So as an employer you should carefully listen to complainer first and understand the happenings in your organization. Many times the accuser face prejudices from their associates as well because of the high-strung nature of the complaint. Such as discrimination based on skin color, race, and religion or sexual harassment. So the employer should give respect and pay proper attention to what they say. But what if the complainer has a good history of making trivial complaints you have listen to him/her. After the complaint is registered as an HR you should confirm whether they are real and true, which is based on findings and fact after Out - to - Out Investigation. To conduct a thorough investigation there might be a need to conduct an extensive insightful interview with both the accuser and accused. Even some third parties are also involved. To achieve proper assessment, you should gather all the related information and evidence related to this case. After which you will be able to draw upon a proper evaluation of this discrimination and harassment case. Documentation is a must and very Important. As an HR you should document every circumstantial detail about the incident right from testimonials, interviews, and evidence. All this documentation will help accuser to decide to take this report to higher authority. This is a very important step as keeping the record on such a delicate issue will create a better preventive policy for your company to monitor harassment and discrimination at work. As an HR you should keep in mind that the complainer is the victim. He/She will have no delebrate intention of filling a harassment and discrimination incident unless it is a serious matter. So when some of your employees take this, they should not be Retaliate. In such incidents, confidentiality plays an important role. When this incident is spread to the public then there are high possibilities that your employees will show an inclination to either party thus leading an unhealthy workforce relationship. So such an incident should be kept confidential within related people and prevent people from sending rumors. Harassment and Discrimination issues should never be delayed. After you receive the complaint you should conduct proper inquiries and take concrete and instant action. Delays in such incidents will compel your accuser to act beyond and required legal action. However, when you as an HR take concrete and immediate action on discrimination and harassment incidents will save your employers brand repute which will obviously build employee relationship.